« Hail Hail, Jerry Miller! This doesn’t direct tie directly into the LOUIE universe, but I figured anyone hip to the roots rock music circle that LOUIE is a part would appreciate this information. 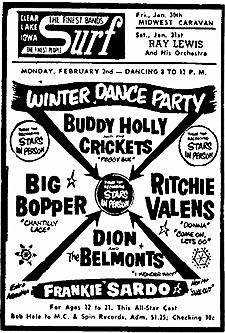 For the past few weeks, I’ve been seeing a lot of things regarding the final flight of Buddy Holly, Richie Valens and the Big Bopper. Bill Griggs wrote an article about Buddy’s overnight bag, which was given to him by Buddy’s brother. One my MySpace friends, Kevin Montgomery, created a wonderful video blog about what it was like to play at Clear Lake, Iowa for the 50 Winters Later celebration. Kevin’s father, Bob Montgomery was an early songwriting and collaborative partner of Buddy Holly, creating music together as “Buddy and Bob.” In this blog, Kevin writes and shares videos of what it was like to hang with the other people that attended this special event – Tommy Allsup, Maria-Elena Holly (Buddy’s widow), Jerry Allison of The Crickets, our friend Pat Dinizio of the Smithereens, Dave Mason, and a lot of other good people. Here’s a little video from Kevin’s collection, shot with a little Flip Video HD camera. Thank you for posting the video. It was an honor to be there, and I hope I did the evening justice.